More than 350 locals students received a first-hand look at tech careers, and the path to get there, at the STEM Expo. EDWARDS — Tech companies need more brainiacs and are willing to pay more than $50 an hour to get them. Local schools are developing STEM programs — science, technology, engineering and math — to turn out as many brainiacs as possible, even creating an academic pathway to those tech jobs. 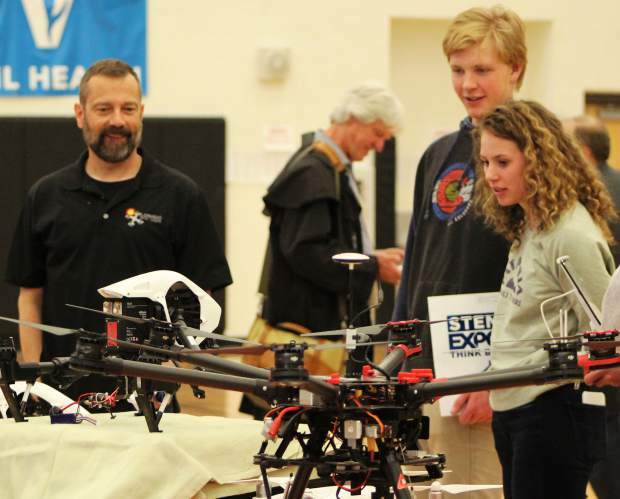 STEM Expo was more than 30 companies and universities presenting the possibilities to 350 local students on Friday, April 6, at Battle Mountain High School, Colorado Mountain College and the HAATS headquarters at the Eagle County Regional Airport. Assistant Superintendent Phil Qualman put it together with others, including Jay Lindell, aerospace and defense industry champion with Colorado’s Office of Economic Development and International Trade. “Champion” was Gov. John Hickenlooper’s idea, Lindell said. Qualman and others put together a road map, so if students want one of these millions of hard-to-fill and therefore good-paying jobs, then they know exactly what classes to take on that path. That path, by the way, leads to jobs that pay $50.66 an hour in Colorado, according to the Bureau of Labor Statistics. “To have an available, skilled and talented workforce, you start by inspiring kids,” Lindell said. Qualman said the event was designed to encourage students to dream big about future career opportunities in five key industries: advanced manufacturing, aviation, cybersecurity, space exploration and robotics. ISACA, the Information Systems Audit and Control Association, a nonprofit information security advocacy group, predicts there will be a global shortage of 2 million cybersecurity professionals alone by 2019. Ted Archibeque owns Archibeque Land, the first firm in Eagle County to use aerial photogrammetry to model the earth with photographs. “It creates 3-D models. We use high-tech gear to stitch it all together,” Archibeque said. Dr. Rob Fredell, president and CEO for the Challenger Learning Center in Colorado Springs, conducted two simulated space missions with 50 students. Another simulation let students deal with a tropical island that was hammered by a volcano and hurricane at the same time. 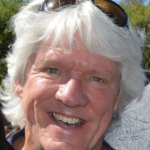 Eric Frew is an engineering professor at the University of Colorado. “We’re here to inspire the students,” Frew said. They’re also showing off a little, which is also fun. For the STEM Expo, they were demonstrating how they use drones to study tornadoes and to track radios for tracking lost people and animals. They chase the storms — sometimes for hours — get close and fly their drone. The Federal Aviation Administration requires them to get their big, yellow drone back at the end of the day. Usually, they do. “It’s a risky environment into which you might not want to send a piloted aircraft,” Frew said. Ramya is a Ph.D. student at the University of Colorado working with Frew. She’s from India and didn’t feel like spelling her last name. “It’s too long,” she said. Her undergrad degree is in aerospace engineering, and so is her Ph.D.
She’s one of those coming up with the system to track phone signals from lost hikers. It will also track animal migration patterns. CU has been using drones since the 1990s. Its unmanned drone center has been around since 2003. Tech sometimes takes the path to fun. Rob Romash is a professional toy maker and built prototypes for the Super Soaker squirt gun. He has been building model planes since he was 4 years old. He came home from college one summer and spotted a help-wanted ad in the Newark Star-Ledger for a model maker. “Someone will pay you to make models? Are you kidding me? I’d pay someone to let me make models,” Romash said. He loves the toy business and owns his own toy company, Eclipse Toys. The latest product is a remote-controlled truck that flattens pretend roadkill. It’s awesome; it’s called Redneck Roadkill, and it’s selling like you think it would — awesomely.